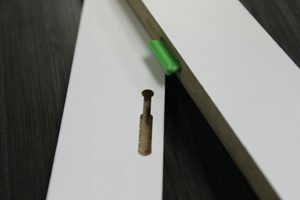 Lockdowel announces the company’s new Mini Barbed Channel Lock, a simple solution to fastening thinner boards. This small fastener yields an amazingly strong bond for half inch and thinner boards, resisting at least 70 pounds of pull force. Ideal for drawer boxes and cabinets, the new Mini Barbed Channel Lock makes assembly simple with Lockdowel snap-in technology. In addition, assembly is 60% faster compared to fastening with glue, dowels and screws. Once assembled the Lockdowel Mini Barbed Channel Lock is completely invisible. “Not only were the Lockdowel boxes stronger, they never came apart or broke even after seven 25 pound weight drops from the handle of the drawer!” Bryan Koelling President of Lockdowel says. “The dovetail boxes failed after the first drop.” Bryan added further. The Lockdowel Mini Barbed Channel Lock comes in nylon and metal. It has a pull force of 70+ pounds: and a sheer force of 50+ punds. Once inserted, they can be disassembled for reassembly.